Japanese Morning Glory Seeds, Ipomoea Nil: SUIGETSU (Water Moon). These are in the ORIGINAL PACKAGE FROM JAPAN. It produces delicate-looking, large, multi-rayed, extremely ruffled, sky-blue flowers with huge white throat. With a little imagination, one can picture the throat as the moon floating in a sea of blue, hence how appropriate and romantic the name is! These seeds are ARE IN THE ORIGINAL SEED PACKAGE FROM THE COMPANY IN JAPAN. These are not home-grown but professionally grown and packaged in Japan. You are getting the pure, original seeds here (not crossed)! All the Japanese Morning glories I've planted this year have had EXCELLENT germination results! Although literally translated 'water moon', the true meaning of this name is more along the lines of 'moonlight reflected in the water'. These are large bloomed Japanese Morning glories. It produces multi-rayed, extremely ruffled, sky-blue flowers with a huge round white throat. With a little imagination, one can picture the throat as the moonlight reflecting peacefully in a sea of blue, hence how appropriate and romantic the name is! NOTE: I don't know how many seeds are in the pack it doesn't say, even in Japanese! 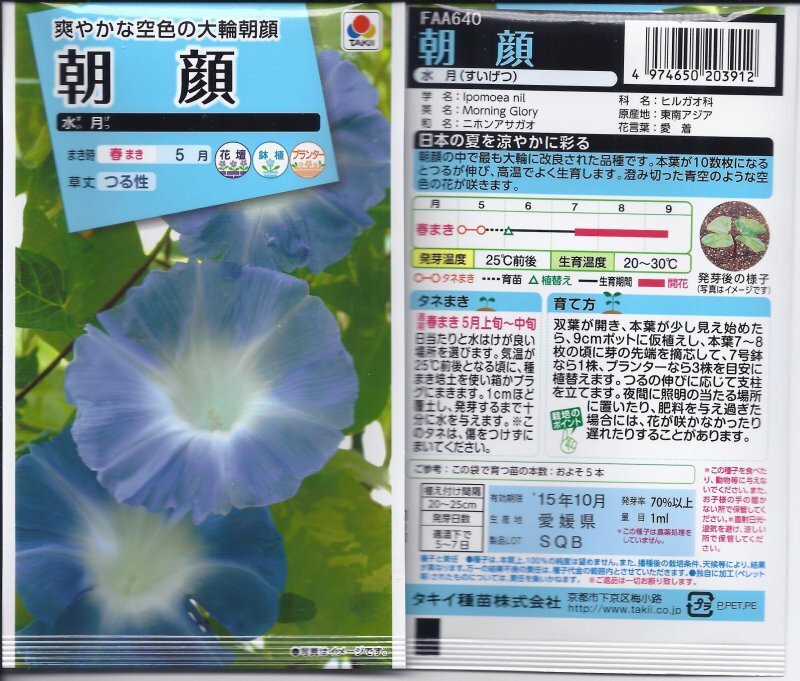 From my experience with the Japanese Morning glories, there should be between 10 and 15 seeds per pack. You are getting a FULL, UNOPENED PACKAGE.